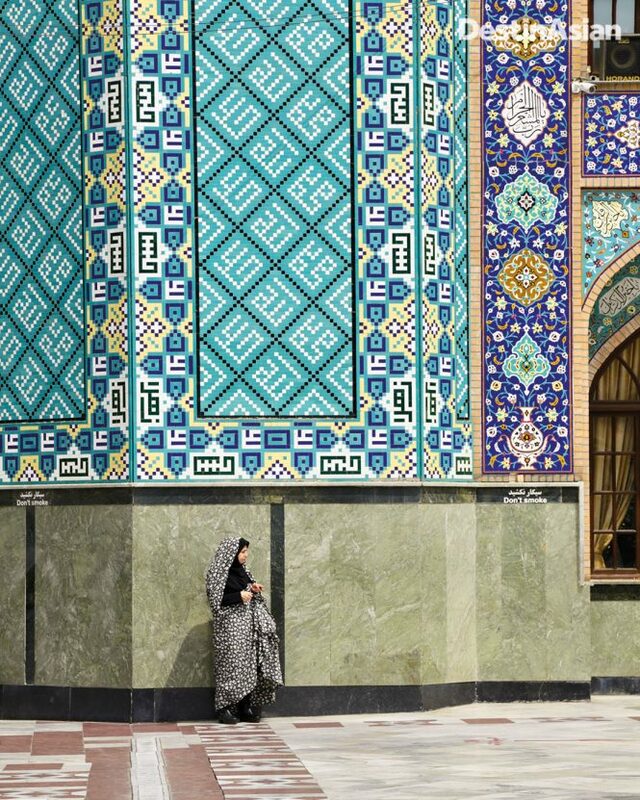 Once little more than a stopover en route to Shiraz, Yazd, or Isfahan, the Iranian capital now offers plenty of reasons to linger beyond its mosques and bazaars. It’s sunset in Tehran, a city that on first impression is admittedly hard to fall in love with. The Iranian capital has seen its metropolitan population swell to more than 15 million since the 1979 Islamic revolution, and the results are infamous levels of pollution and congestion. Dominating the urban sprawl are stark gray apartment blocks and unfinished malls that belie the country’s rich history of boundary-pushing design. After touring the architectural wonders of Shiraz, Isfahan, and World Heritage–listed Yazd, I find Tehran to be decidedly unlovely. But then I visit Tabiat Bridge. As the day’s last light sets the snowcapped Alborz Mountains to the north of town ablaze, I can’t help but feel that the country’s most secular and liberal city is well on its way to becoming its most interesting. 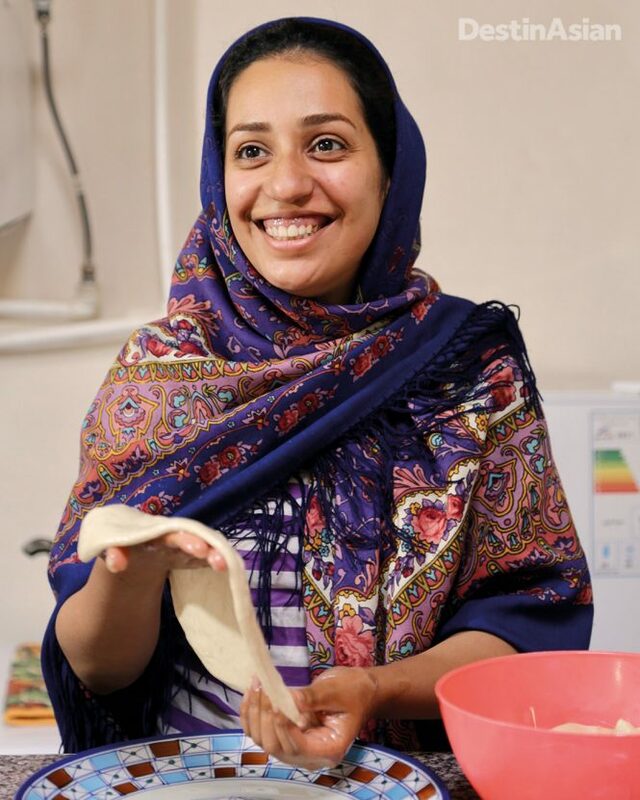 Arsha Yazadi in the kitchen at the Iranian Artists Forum’s vegetarian restaurant. 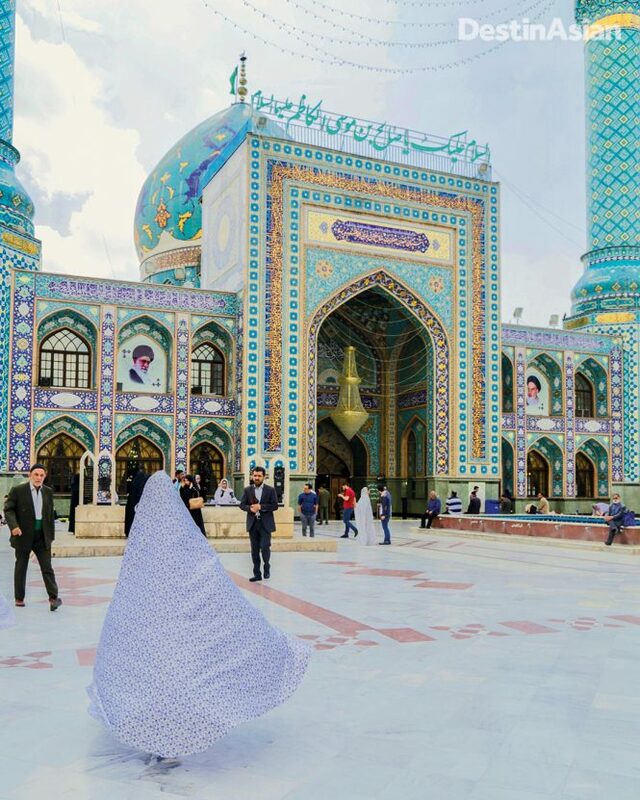 It’s the start of the holy month of Ramadan, and hundreds of Tehranis are out enjoying the sunny weather before the call to prayer that signals the end of the fasting day. Young couples are holding hands and strolling along the Tabiat’s wide wooden walkways; others are taking selfies beside lush garden beds that create a green arc over one of the city’s busiest highways. It’s an incongruous place to watch the day disappear. But then again, this is not your average bridge. 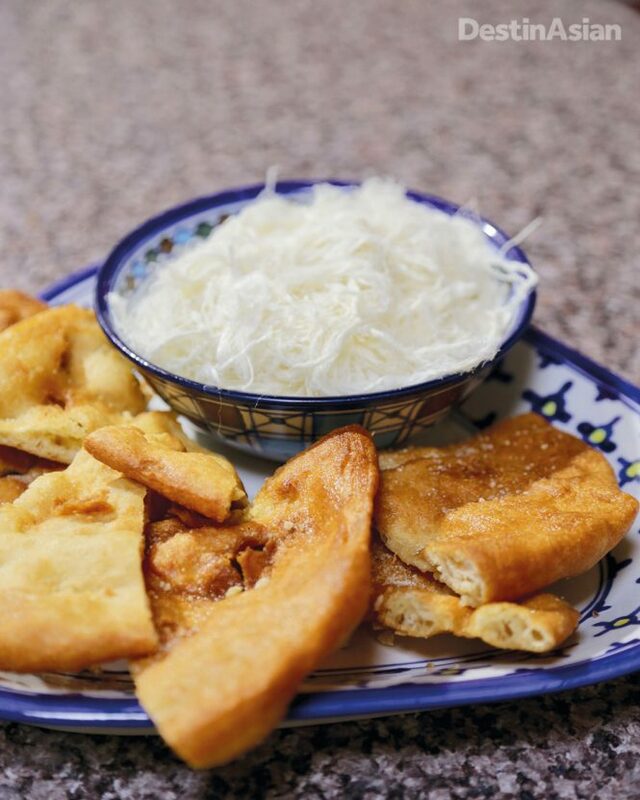 Sirog flatbread with ground baklava, drops of rosewater, and Persian fairy floss. Unveiled in 2014 by Tehran’s then long-serving mayor Mohammad Bagher Ghalibaf, the high-tech pedestrian overpass is the brainchild of young Iranian architect Leila Araghian, who was just 26 when her plans were selected for the design. 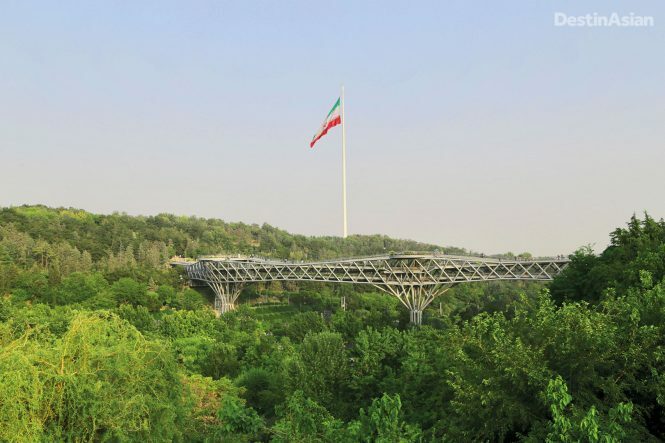 More than 270 meters long, the Tabiat—the name means “nature” in Farsi—connects two parks in the north of the city and has multiple pathways and three levels of restaurants, cafés, and places to lounge amid verdant foliage. “It is intended to be a place to linger rather than just one to pass through, and to act as an extension of the parks,” Araghain has said of the project, which won the prestigious Aga Khan Award for Architecture in 2016. It’s particularly beautiful from afar, and especially so at night, when the lights illuminating the curving steel-truss span are augmented by huge flames that lick the sky above the adjacent Ab-o-Atash Park, where water fountains splash alongside fire towers. It’s a pleasant place to while away a few hours people-watching and surveying Tehran’s distant skyline. Drab apartment blocks aside, the city also has some jaw-dropping landmarks that show just how ahead of their time its architects were prior to the 1979 Islamic revolution. 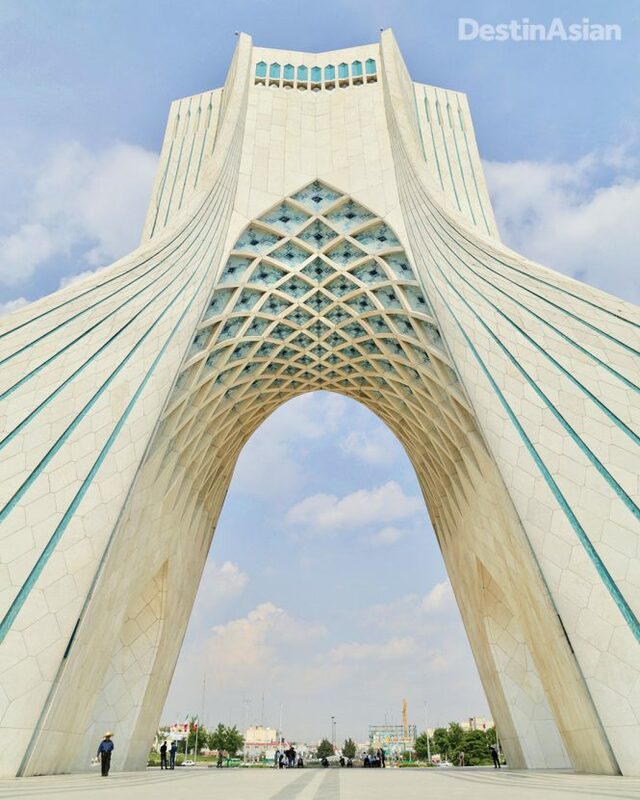 Among them is the dramatic, inverted Y–shaped Azadi Tower, built of white marble in 1971 to commemorate 2,500 years of Persian civilization. Over the decades, the 54-meter-high monument has withstood revolution, rallies, and an eight-year war. In the last couple of years, its interior and cavernous underground vault have been transformed to host exhibitions, a library, a museum, and a gallery. A worshipper at Imamzadeh Saleh mosque. 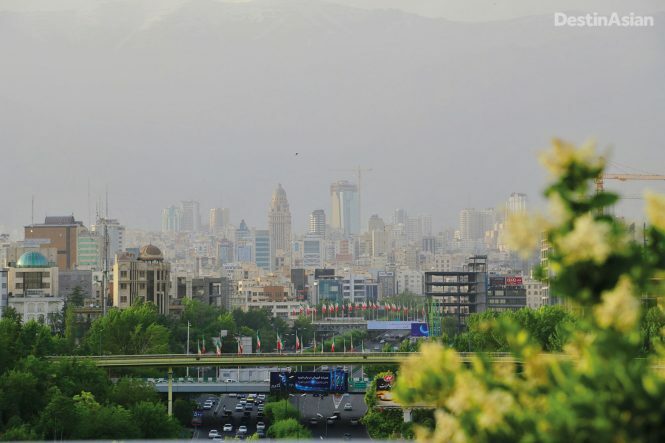 Sizable pockets of Tehran are now dominated by scaffolding and cranes, emblematic of the mad rush to keep pace with city growth, not to mention develop new infrastructure following a rapid rise in tourist numbers. Accor debuted its Ibis and Novotel brands here in 2015, becoming the first international hotel chain in the country since the revolution. The lifting of American sanctions the following year saw three of Europe’s most prestigious airlines—British Airways, KLM, and Air France—resume direct flights to Tehran, and packed planes began to land in the capital. More than six million people visited the country in the year ending March 2017, up 50 percent on 2016 and three times 2009 figures. U.S. President Donald Trump’s ditching of the Iran nuclear deal last May has tourism operators scrabbling, however, with officials predicting a minimum 15 percent fall in international travelers for 2018. Still, post-revolution Tehran has nurtured a new wave of distinctive architecture. And like Tabiat Bridge, many recent projects have contributed to the city’s regreening, in an attempt to bring back the trees and parks that were lost to urbanization over the last century or so. In the northern district of Shemiran, one such project is architect Mohammad Reza Nikbakht’s curved, garden-filled Niavaran Residential Complex. It was specifically designed to ensure no trees were cut down during its construction, which meant building around, and preserving, 128 trees with an average age of 70 years. Architects Reza Sayadian and Sara Kalantary did the same in Tehran’s once garden-filled Danial neighborhood, creating an apartment building that integrates tree-like panels and organic shapes meant to remind residents of lost nature. Iranian architect Leila Araghian’s Aga Khan Award–winning Tabiat Bridge, a 270-meter-long pedestrian overpass that soars above an expressway in northern Tehran. While the city’s Iranian Artists Forum occupies a rather nondescript red-brick building, the cultural complex is set in a leafy park where Tehran’s younger residents hang out sipping coffee and browsing bookstores. Patrols of so-called morality police still drive around town in vans looking for “un-Islamic” dress and behavior, but in the art district I spot young women with hijabs falling back off glossy black hair, their lips firetruck-red and their eyes heavily outlined in kohl. The forum’s various halls and facilities include a theater, cinema, and space for concerts. There are also eight galleries showcasing rotating exhibitions from up-and-coming creatives, and—a rarity in a country obsessed with meat—an excellent vegetarian restaurant. Here I order kashk-e bademjan (a type of smoked eggplant dip with whey) and saffron ice cream and linger while watching chef Arsha Yazadi make sirog flatbread in the kitchen. She deftly shallow-fries the dough for a couple of seconds before topping it with ground baklava, drops of rosewater, and Persian fairy floss. Originally from Taft, a sleepy town on the outskirts of Yazd, Yazadi is a member of Iran’s Zoroastrian community, the country’s oldest religious group (although it’s estimated that there are only 15,000 practicing Zoroastrians left in Iran). Her family still owns a pomegranate orchard and guesthouse in the south, but she now lives in Tehran to provide a better education for her young son. Despite working in a kitchen, Yazadi majored in fine art at university and is excited to take me on a tour of her favorite galleries across town. “There are so many modern galleries in Tehran now,” she tells me. 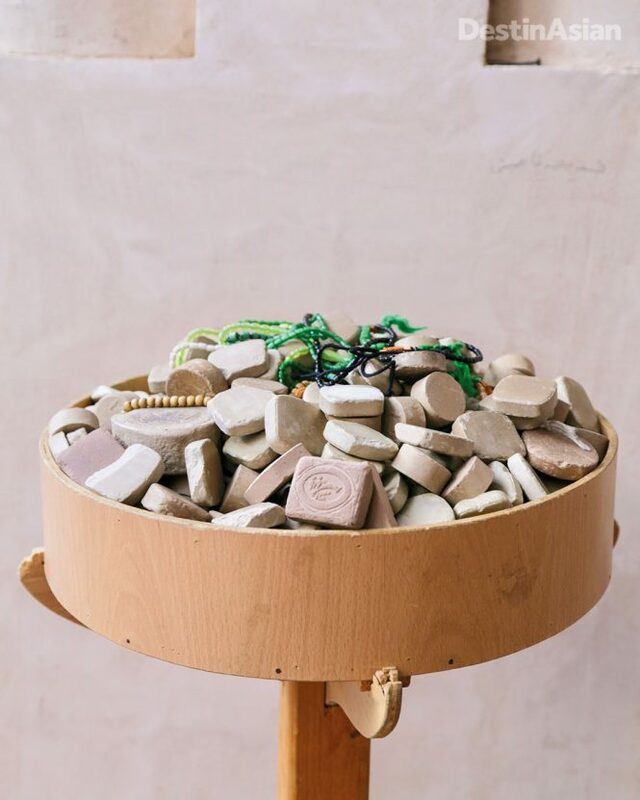 “In recent years there has been a huge increase in interest in Iranian art from international investors.” Indeed. Auction houses have seen record-breaking sales at Bonhams, Christie’s, and Sotheby’s, with more than US$15 million sold in Iranian art in the 2017 spring season alone. In the courtyard of Imamzadeh Saleh mosque. Not far away at Dastan Gallery is an exhibition of striking portraits by Farrokh Mahdavi. Outside in the street, Yazadi points out a small mural by graffiti artists Icy and Sot. Born in Tabriz, the brothers spent some time in Tehran before migrating to the U.S., where they now create eye-popping works on the sides of Brooklyn buildings. We end the day back in the center of town on trendy Enghelab Street, where the University of Tehran’s oldest campus is situated. Thick with students, the avenue is lined with more bookstores than I’ve seen in a long time, and most are packed with locals thumbing through tomes of poetry by Hafez or old prose by Sadegh Hedayat. We find a table at a small café, where Yazadi orders tea and ghotab (almond-filled pastries). Views of Tehran’s skyline from Tabiat Bridge. With no direct flights between Tehran and Southeast Asia (save for a five-times-weekly Kuala Lumpur service operated by Iran’s largest private airline, Mahan Air), you’ll have to fly through Europe or the Middle East. Emirates offers the most convenient connections, via Dubai. One of the city’s newest hotels comes with boutique lodgings, a central location off Vali Asr Square, and a café that makes surprisingly good Italian-style coffee. 98-21/8893-3401; doubles from US$162. This article originally appeared in the February/March 2019 print issue of DestinAsian magazine (“Time For Tehran”).